June 2014 Updates - Why is the City of Tucson Sending Pedestrians to Their Doom? - Part III — Sammartino Law Group, P.L.L.C. In the first two parts of this series, Southern Arizona Public Works exposed the City of Tucson's casual approach to pedestrian safety by highlighting poor construction and installation of marked-but-unsignalized-pedestrian crosswalks. Unfortunately, even when the City does install signalized-pedestrian crosswalks, it locates them improperly, thereby diluting their benefit to pedestrian safety. 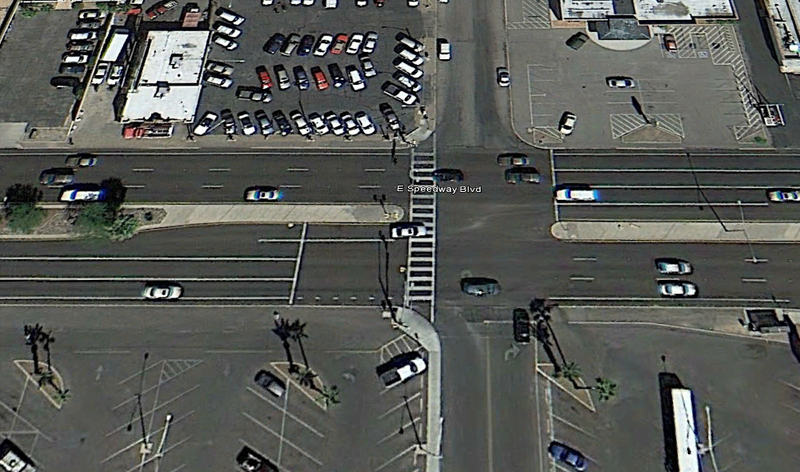 The City of Tucson installed a HAWK at this intersection using the previously-marked crosswalk. The City of Tucson can, and should, do better. The decision to place HAWKs at previously-established-pedestrian crosswalks rather than to install the HAWKs properly under the MUTCD is most likely a financial decision. New crosswalks 100 feet before intersections would be expensive to install. Are the savings worth the safety risk? This is an issue the City always gets wrong. Click through the gallery below for many examples of HAWKs the City of Tucson has improperly placed.